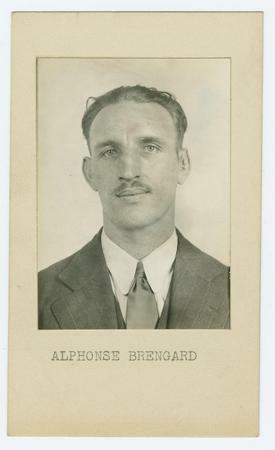 Mug shot of Alphonse Brengard. Sing Sing Prison mug shot of prisoner Alphonse Brengard. Black & white head and shoulders portrait, facing front. Permission must be requested from libspcoll@jjay.cuny.edu or click the contact icon above before publishing, posting, or otherwise distributing these materials. We normally respond quickly and positively to all such requests. It is the researcher's obligation to determine and satisfy copyright or other use restrictions when publishing or otherwise distributing this digital asset. Email Library staff about this object.